May’s journal focuses on activity in and around backyard feeders one afternoon on the north end of the neighborhood. We were invited over to see Rose-breasted Grosbeaks who had been showing up to recharge on good food in a wonderful wooded setting before continuing on their migration. For one hour we sat quietly with our friends and watched. This is some of what we saw. This entry was posted in Bird Feeders, Bird Migration, Feeding Birds, Monthly Journal and tagged Blue Jay, Common Grackle, Downy Woodpecker, Eastern Bluebird, House Finch, May, Mourning Dove, Northern Cardinal, Red-bellied Woodpecker, Rose-breasted Grosbeak on June 1, 2017 by beveritt. Last July our post Here’s Looking At You was about Barred Owls in Sandy Springs with two great photos taken by our friend Cindy Mayer. She has a piece of wooded property with pines and thought it would make great habitat for the owls. We offered to make an owl nestbox for her in return for more photos if it were used by the owls. She and her husband paid a tree service to put the nest box way up in a pine. And she was right about the location! 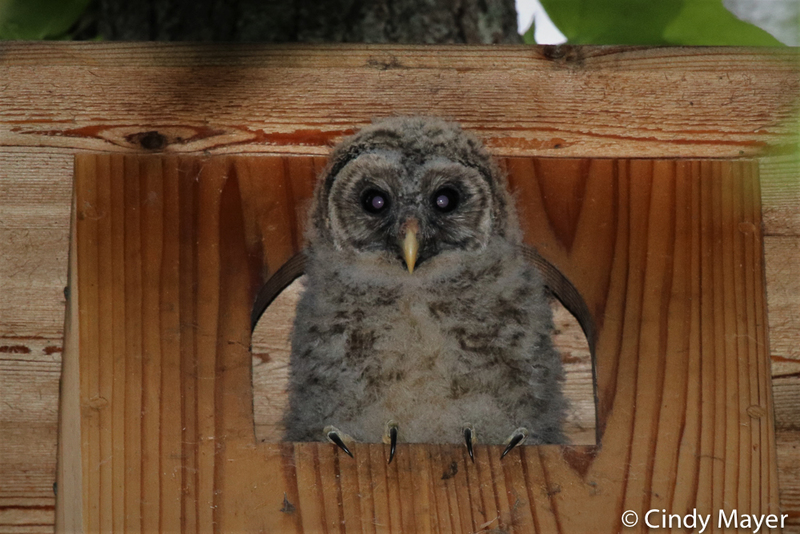 Today she sent us photos of a young owlet in the box. It’s a great story, as told in her own words. 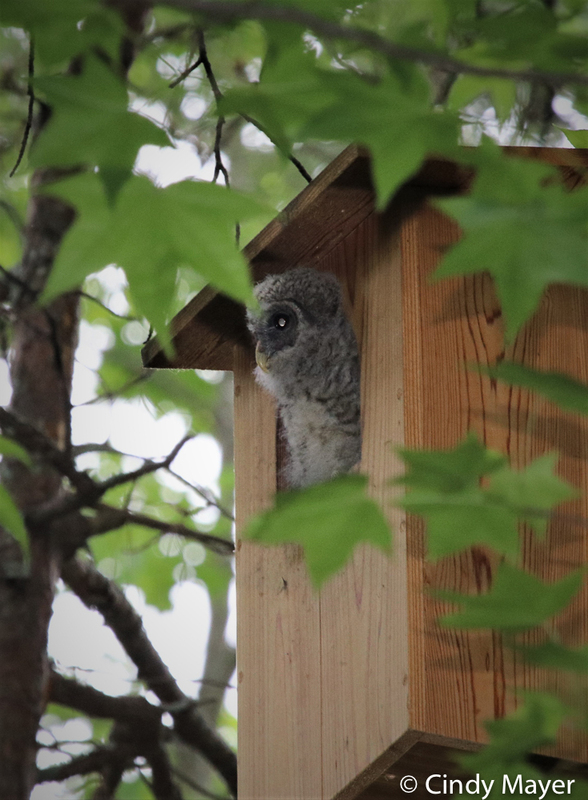 “After we moved into our house about 3 years ago, we spotted two adult barred owls in our backyard & neighbors indicated they’d unsuccessfully nested in a tree stump across the street the previous year. That was enough to set me on a mission! I researched owl nest boxes including where & when they should be placed with hopes of enticing the owls to raise a family in our yard. 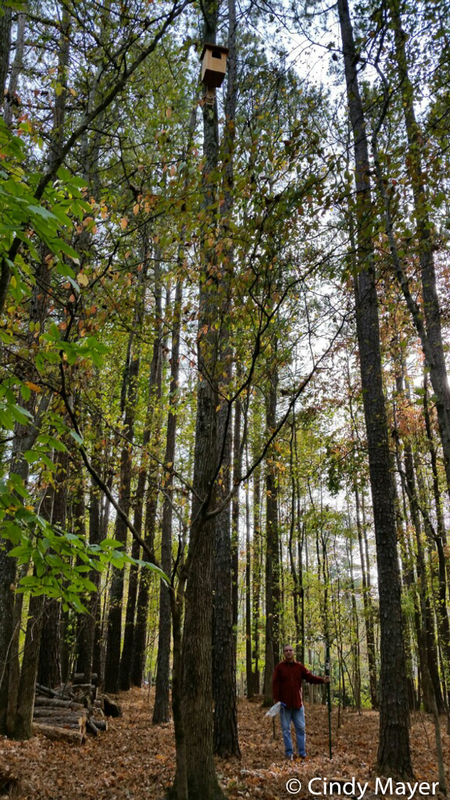 We live in a forested neighborhood near the Chattahoochee river. Thanks for the story and photos Cindy and for all the great things you do for wildlife. Such an inspiration–what we do in our own yards matters! This entry was posted in Bird Houses, Bird Nesting, Owls and tagged Barred Owl on May 13, 2017 by beveritt. 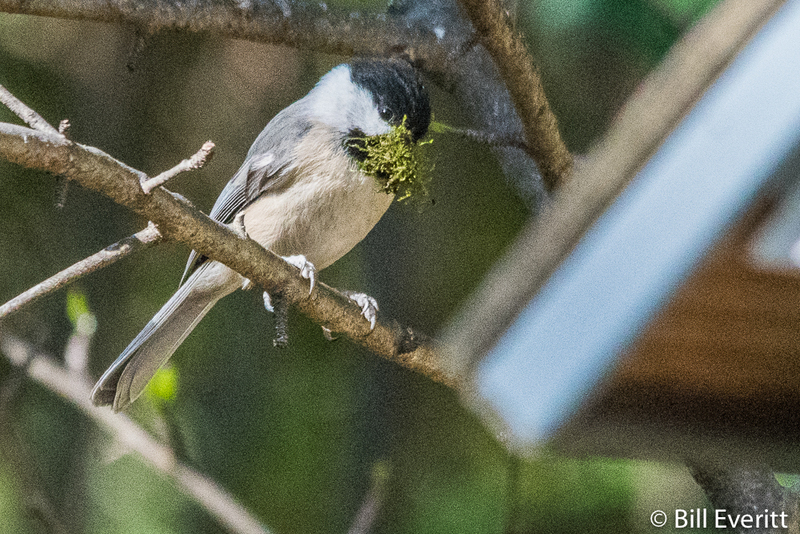 April was a busy month with much nesting activity all over the neighborhood. Three of the four bird houses on the Nature Trail have occupants. Two neighbors on Darlington Commons had nests in shrubbery right outside their front door, and we counted at least four nests in our yard, including a Brown Thrasher pair who nested in the Carolina Jessamine vine on the side of the house. Most trees have leafed out now. American Basswood, Pignut Hickory, Georgia Hackberry and Southern Sugar Maple along with eight other species were identified on the Nature Trail and will be marked. Hummers are here for sure, and flowering plants like Crossvine and Native Honeysuckle are in bloom for them. And it looks like the Wild Turkey hen has moved on. We hope she’s safe and well. This entry was posted in Bird Nesting, Monthly Journal, Spring, Trees and tagged American Basswood, April, Brown Thrasher, Carolina Chickadee, Carolina Jaessamine, Carolina Wren, Crossvine, Eastern Bluebird, Georgia Hackberry, House Finch, Northern Cardinal, Pignut Hickory, Pipevine, Southern Red Oak, Southern Sugar Maple, Suragberry, Tulip Poplar, Wild Turkey on May 1, 2017 by beveritt. Hope not, because we had a chance to see the turkey hen up close; probably the same one reported in last week’s post: Pretty Wild. Perhaps you might like a follow up. This beautiful bird was roosting on a limb only a few feet from the back door. She was not at all bothered by us standing only 25 feet away and stayed on her perch for several hours. There are a few wooded acres in back of the houses which probably makes good habitat. And the next door neighbor reported seeing her on their driveway and front walk. Maybe our turkey will hang around. We hope so! 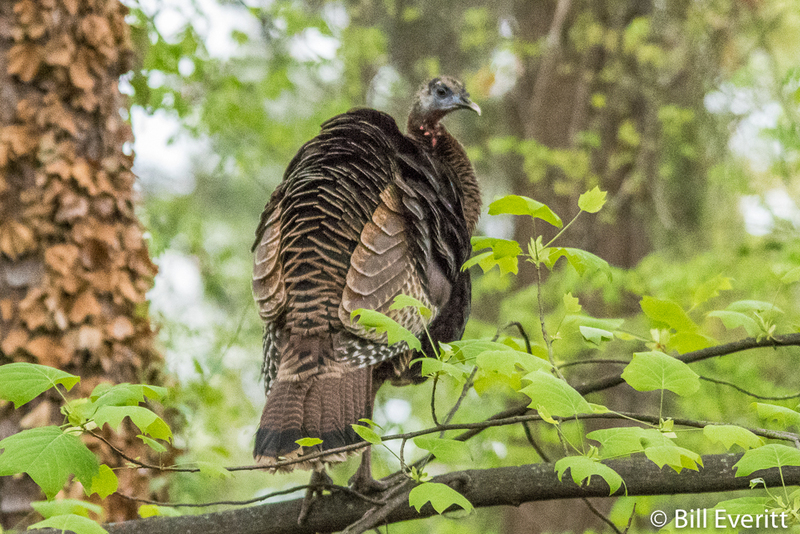 This entry was posted in Birds and tagged Wild Turkey on April 7, 2017 by beveritt. Wild Turkey that is. 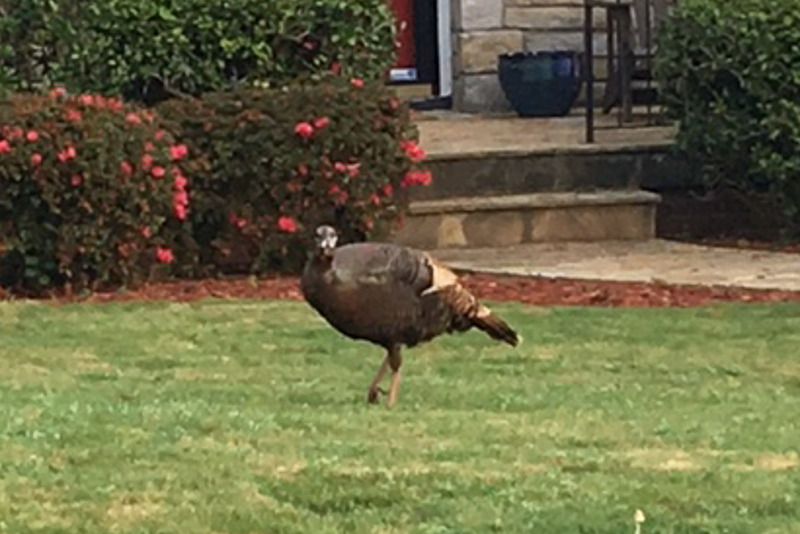 Almost exactly this time last year someone from the north side of the neighborhood sent us an email report of a wild turkey in their back yard. We set up a camera, but never got a picture. 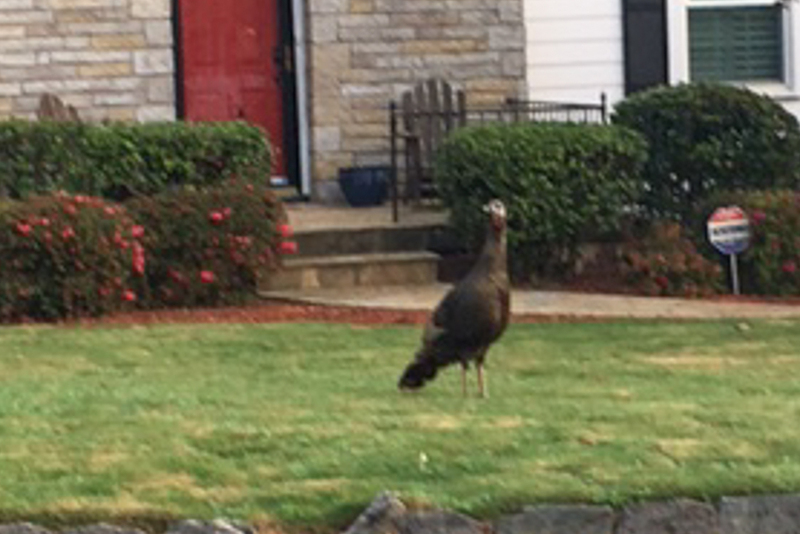 But today, a neighbor on the south side did get pictures of a wild turkey hen right in someone’s front yard. She was seen early this morning. We couldn’t find the bird ourselves, but we did talk to the neighbor who kindly sent us the pictures to share. Every now and then something really cool like this reminds you that there’s more wildlife in small intown neighborhoods than you think. This entry was posted in Birds and tagged Wild Turkey on March 29, 2017 by beveritt. There’s a lot of nesting going on already. We count at least 4 active nests in our yard, including Carolina Chickadee, Brown Thrasher, Brown-headed Nuthatch, Carolina Wren and perhaps a Song Sparrow. Cardinals are eyeing nesting locations and there will probably be more soon. A friend, who has much better eyesight than either of us, swears he saw a hummingbird in our yard yesterday. He probably did. The Native Honeysuckle is starting to bloom and that’s always been our indication that hummers are here, or will be shortly. Most likely it will be a Ruby-throated Hummingbird that you see. While they are the only hummingbird that nests in Georgia, 10 other species are seen in this state. Time to plant hummingbird-friendly flowers and hang your feeders. Trees Atlanta is having their 5th annual Native Wildflower and Plant Sale on Saturday, April 1st at the Freedom Farmer’s Market at the Carter Center. They will be selling native perennials and vines that are tree-friendly (it is a Trees Atlanta sale after all). This is a chance to support Trees Atlanta and get great plants that are grown by reputable growers. Their plant list for the sale has many of the plants that we have on our list of Perennials for Your Yard. All good things for trees and for wildlife. We follow an excellent blog called Using Georgia Native Plants. In their post of March 12, they wrote about a new book titled Bees – An Identification and Native Plant Foraging Guide by Heather Holm. We couldn’t do without our own copy, and it is a beautiful book. If you read the blog post you’ll see that the author calls attention to a section in the book describing the value of trimming stems from last-year’s plants (perennials) to a length of about 15 inches. The new growth will soon overtake the stems to hide them, but in the meantime this creates a home for tiny native bees that are so important as pollinators. They will nest this spring and summer, overwinter in this safe haven and then emerge the following spring. You can see the before and after efforts of our trimming below. This entry was posted in Bees, Bird Nesting, Spring, Trees Atlanta and tagged Native Bee, Ruby-throated Hummingbird on March 19, 2017 by beveritt. January was an unseasonably warm month. Lots of bird activity with many of the usual suspects and one unexpected rare appearance by a Wilson’s Warbler (see our recent January 14 post). In addition to the photos below we had visits from a Great Blue Heron and a Red-tailed Hawk. The Northern Flickers in the photo below were engaged in a territorial fencing display, which we have seen one other time. This entry was posted in Birds, Critters, Monthly Journal, Trees and tagged American Goldfinch, Brown-headed Nuthatch, Carolina Wren, Chipmunk, Crocus, Eastern Bluebird, Eastern Towhee, Golden-crowned Kinglet, House Finch, January, Mourning Dove, Northern Cardinal, Northern Flicker, Northern Mockingbird, Pine Warbler, Red-bellied Woodpecker, Red-Winged Blackbird, Saucer Magnolia, Tufted Titmouse, White-breasted Nuthatch, Wilson's Warbler on January 31, 2017 by beveritt.